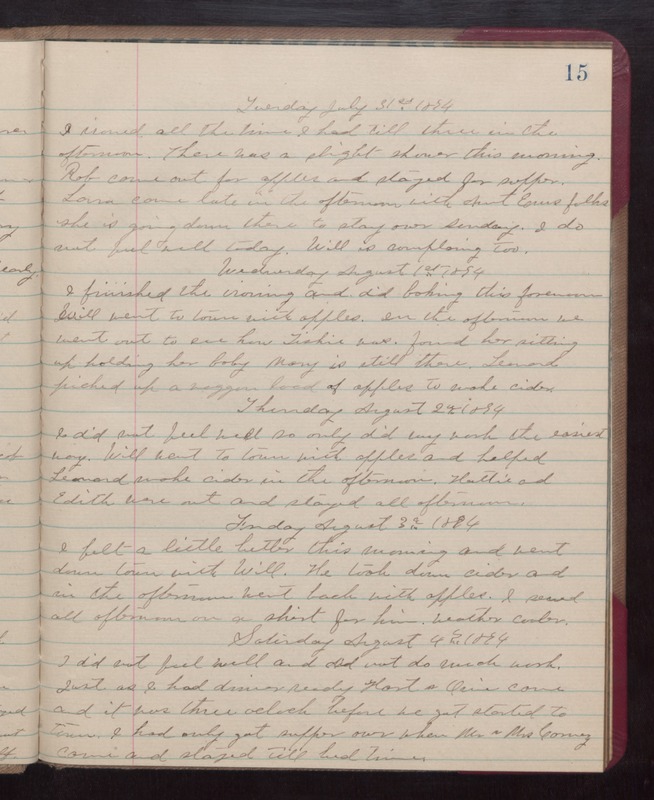 Tuesday July 31st 1894 I ironed all the time I had till three in the afternoon. There was a slight shower this morning. Rob come out for supper and stayed for supper. Laura came late in the afternoon with Aunt Ems folks she is going down there to stay over Sunday. I do not feel well today. Will is complaining too. Wednesday August 1st 1894. I finished the ironing and did baking this forenoon Will went to town with apples. In the afternoon we went out to see how Tishie was. found her sitting up holding her baby. Mary is still there. Leonard picked up a waggon load of apples to make cider. Thursday August 3rd 1894 I felt at little better this morning and went down town with Will. he took down cider and in the afternoon went back with apples. I sewed all afternoon on a shirt for him. weather cooler. Saturday August 9th 1894 I did not feel well and did not do much work. Just as I had dinner ready Hart & Orie came and it was three oclock before we got started to town. I had only got supper over when Mr & Mrs Carney came and stayed till bed time.